Thursday was my sister’s birthday. I tend to be the official birthday cake baker in the family so I of course volunteered to make my sister’s cake. 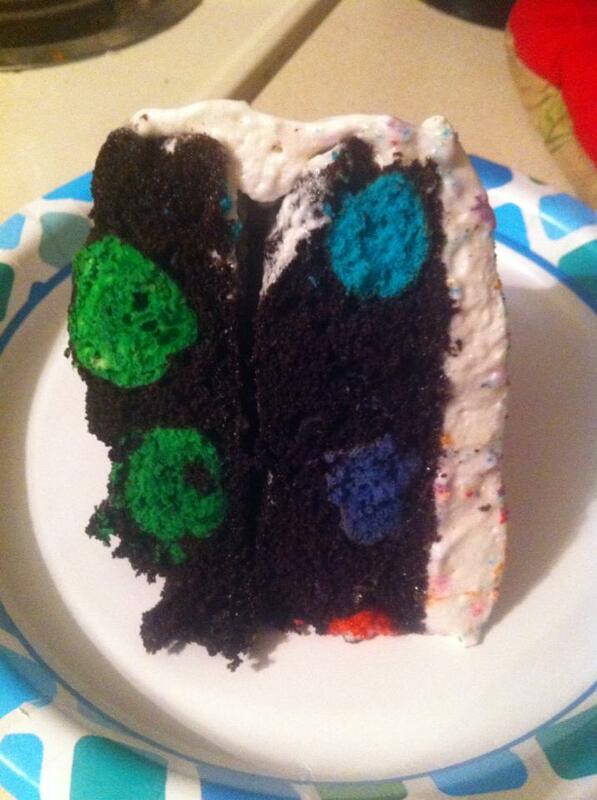 Besides I had been waiting for an opportunity to make a polk-a-dot cake after I had seen one pinned on Pinterest. 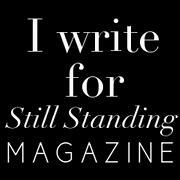 It’s one of those things that seems like it would be a lot more complicate than it actually was. To start I made up a simple white cake batter and divided it into several different bowls (7 in this case) and then I added a bit of food color to each bowl. 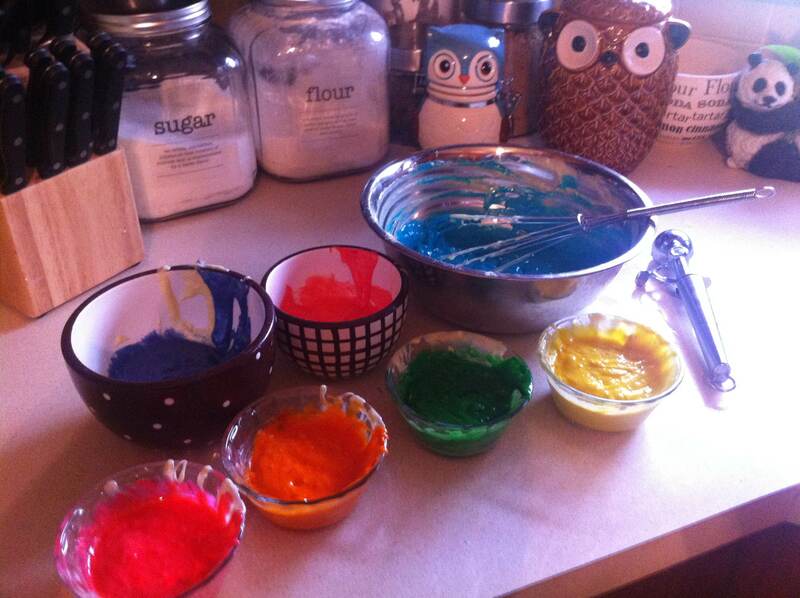 I use Wilton gel food colors because the colors tend to be just a bit more vibrant that the liquid ones you find at the grocery store. 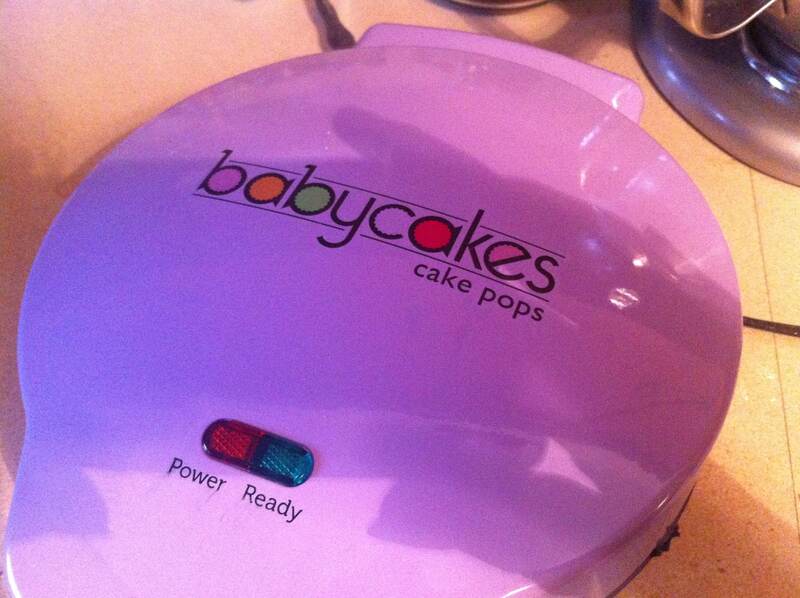 Once I had all of my different colors, I plugged in my handy little cake pop maker to get it warmed up. My little Babycakes machine is one of the wedding gifts that is fun, but honestly, I rarely actually use it, so this was a perfect opportunity to put it to work. Note: I didn’t let the cake pops cook quite all the way through since they were going to be baked again, just enough that they held their shape. 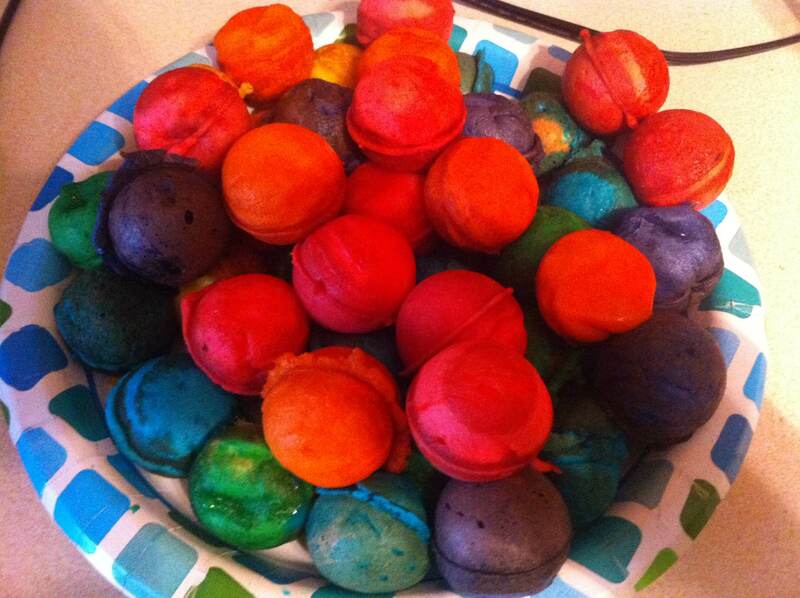 See my huge pile of colorful cake balls below? Pretty. Next, while the cake balls were cooling, I made up another batch of cake batter – this time it a dark chocolate. I took two round cake pans and lined them with parchment and then added a bit of the chocolate cake batter and poured it into the bottom of each pan. You could technically use three round cake pans here, but well frankly I was doing this on a Wednesday night after I came home from work and I was tired, so I only used two. Then I carefully placed the multi-colored cake balls in each of the pans and then poured the rest of the chocolate batter on top of the cake balls so they were completely covered. I then baked the cakes like I normally would. 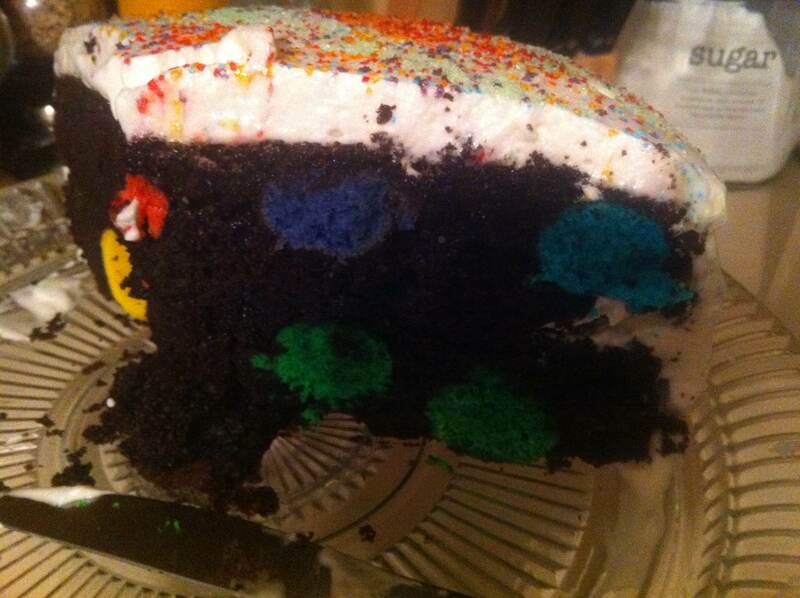 All in all it was relatively simple – certainly one of the easier cakes I’ve ever made. 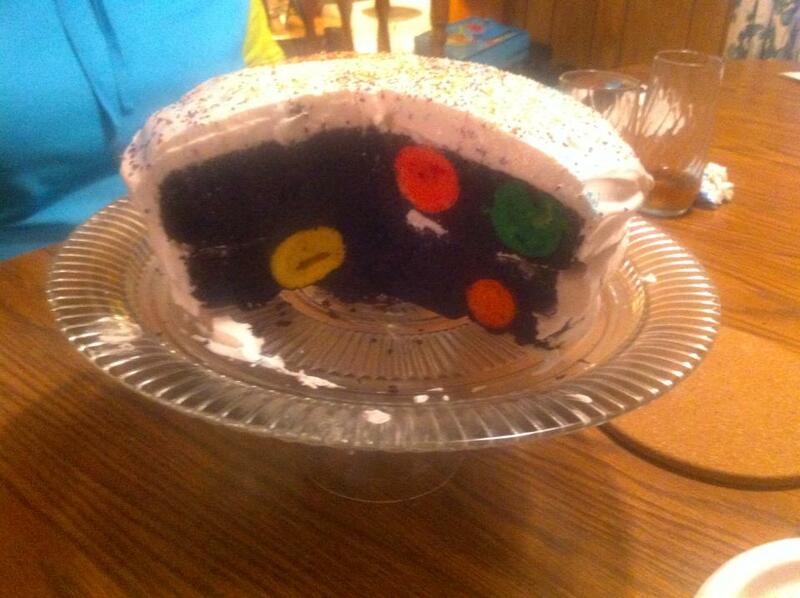 I was so excited to actually cut into the cake and see all of the different colors. I think next time I would use more cake balls in each layer as there seemed to be a few of places where it seemed like there should have been a dot. But for a first try at it, I think it turned out pretty well. 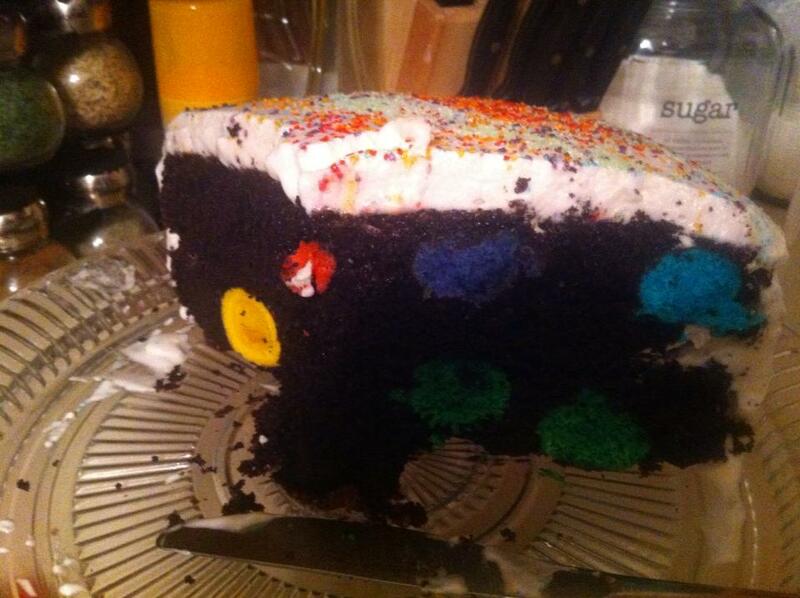 Besides how can you really go wrong with a polk-a-dot cake? Seriously, I couldn’t stop taking photos every time we took a slice. I’ve seen these too, and keep looking for a reason to try it. Good to know it’s not too hard! 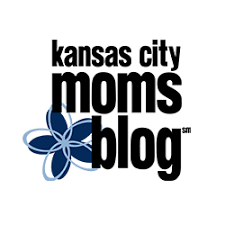 It’s so easy and so much fun! OK, I’m making this for a house warming party. Fingers crossed!